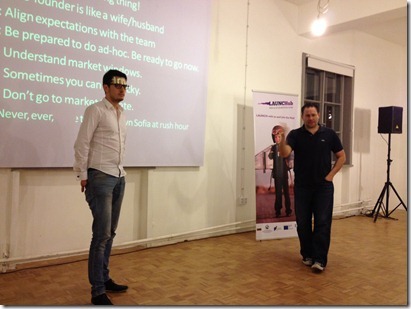 On Tuesday night I visited and delivered a talk to the cohort at Launchub, Bulgaria’s first software startup accelerator. Launchub is financed by a seed fund made up of private and EU money. Launchub is hosted at a great co-work space, betahaus, in downtown Sofia. It was great visiting betahaus and meeting the teams. I quickly noticed that the Bulgarian accelerator is the exact opposite of AcceleratorHK; in Bulgaria, the teams are engineering heavy, while in Hong Kong, the teams are business people/designer heavy. Too bad we are too far away for a merger. I delivered a talk titled: “Lessons Learned From a Career in Startups.” I spoke about raising money, how a business partner is like a wife/husband, how to align staff’s expectations with your own, and then some general customer development (pivots, mvps, and all the current popular lingo.) My bosses at Telerik are involved in the accelerator and are mentors, so I told some jokes about them too. Evelin Velev from the team did a great job with absolutely no prep time. To round out the evening, I put one of my Telerik colleagues on the spot when asked about the future of hybrid development. 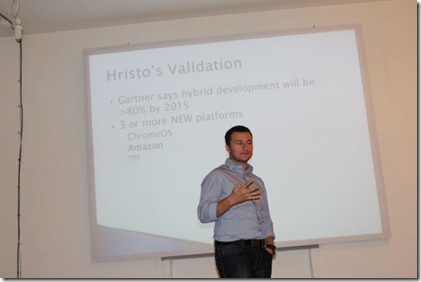 Hristo Neychev is the director of BizDev for Icenium, so he best be able to do this. He did not disappoint and we had fun, I was making slides on the fly for him. After the talk and lively Q&A session, we went to a downtown bar and had some food and drinks and talked all night long about startups, technology, and why I joined a Bulgarian Startup when I came to Telerik many years ago. As people realize that the economics of startups have changed and more and more people are willing to jump to a startup, accelerators are popping up everywhere to support them. This includes China. 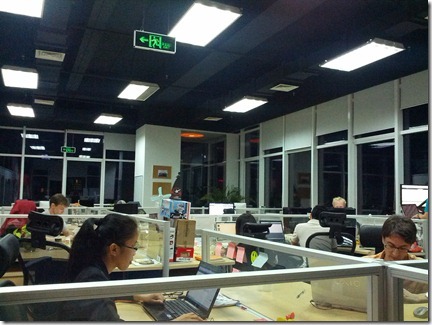 Chinaccelerator based in Dalian, China, is the gold standard of accelerators in China. I am a mentor there and last week went up to Dalian for a visit. The cohort at Chinaccelerator is working out of an awesome office in Dalian with epic views of the bay. Chinaccelerator had me do a two hour talk to the group about my experiences in raising money over the years. I called it “Lessons Learned from Raising Venture Capital.” I went through several lessons I have learned over the years ranging from how much money to raise, how to approach investors, and how to determine valuation. We then had an awesome exchange and Q&A session. After the talk I had one on one meetings with six of the teams and was very impressed with each of them. I suspected that all of them would be targeting the China market exclusively, however, only a handful were, the rest were global in their business plans. I left Dalian inspired by all the teams’ passion and energy. It is great seeing accelerators pop up all over the world to support startups. This week I visit one in Sofia, Bulgaria.